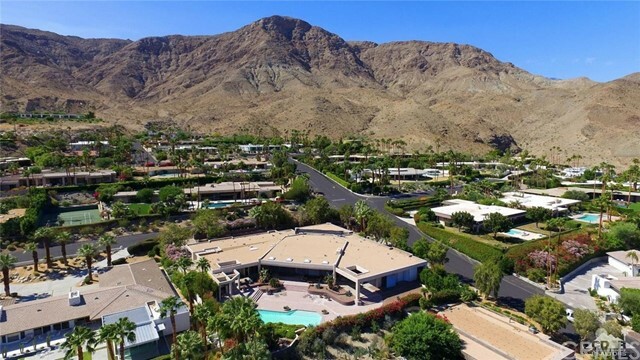 All Rancho Mirage homes currently listed for sale in Rancho Mirage as of 04/19/2019 are shown below. You can change the search criteria at any time by pressing the 'Change Search' button below. 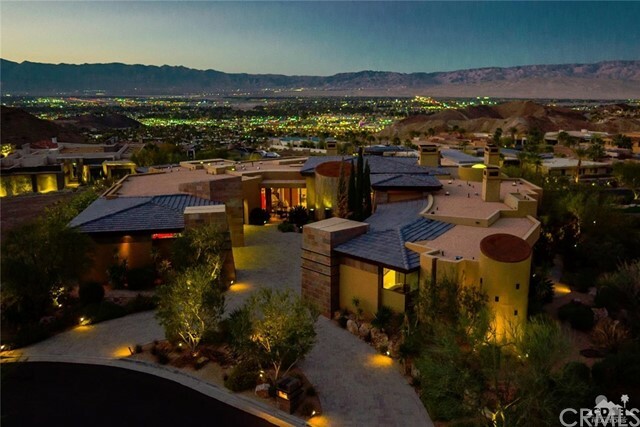 "This exceptional estate in Rancho Mirage is an architectural masterpiece, designed to make you feel on top of the world. 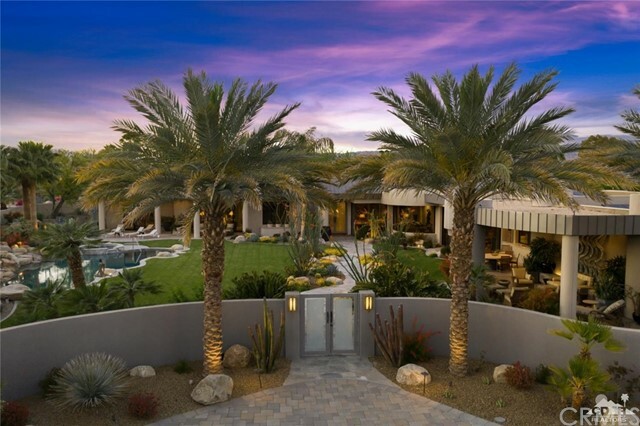 From its award-winning exterior landscape design by Wayne Connor, exquisite interiors by Randy Patton, to architectural design from by Prest-Vuksic, this modern& elegant property epitomizes luxury desert living. The home is built with unique distinctive and handcrafted elements, with each space offering unique details by the finest artisans; it is clear no expense was spared. " 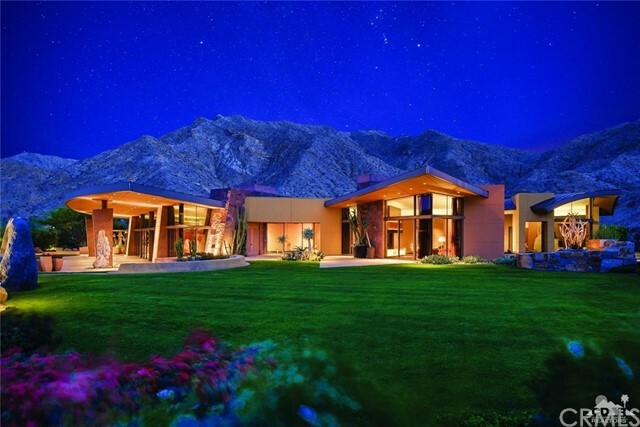 "Most Magnificent Home in the Coachella Valley! Situated on 5 private acres of incredibly landscaped grounds, this Mediterranean style gem has it all. 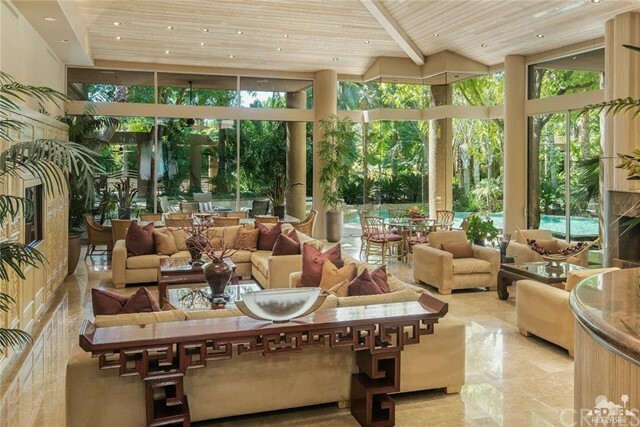 From the majestic Great Room, large enough for 500 guests, to the unique iron clad wine grotto, this home is truly a masterpiece. A master bedroom suite with oversized precast fireplace and bath which includes a sauna, indoor spa and steam room defies description. This one of a kind home features its own off the grid power system as well as its own"
"$1 MILLION REDUCTION IN PRICE! Built in 2008 & expanded in 2015, this 10,000 sq. ft. estate rests on 2 acres and blends design & form in a sophisticated, organic style. From the gated motor court approach, embark on an experience for all the senses! Breathtaking views, exquisite features, technology, solar & seamless interior/exterior living invites relaxation or recreation. The grand, architectural entry flows into a massive living area with 24 foot cedar ceilings, walls of glass & suspended fi"
"New $350,000 price adjustment!! This Thunderbird Cove tennis estate is the epitome of modern elegance, beauty and sophistication. First impressions are magnificent as one enters a massive entry courtyard flanked by a waterfall. Hardwood floors weave spaces together within this 10,000 square foot estate featuring glass walls that deliver striking outdoor views from every perspective. Walls of glass create a seamless integration between lavish interior living spaces and outdoor entertaining. Ameni"
"One of the finest homes Mirada Estates has to offer. Architect Dave Prest and interior designer Jeff Jurasky combined efforts to create this masterpiece. 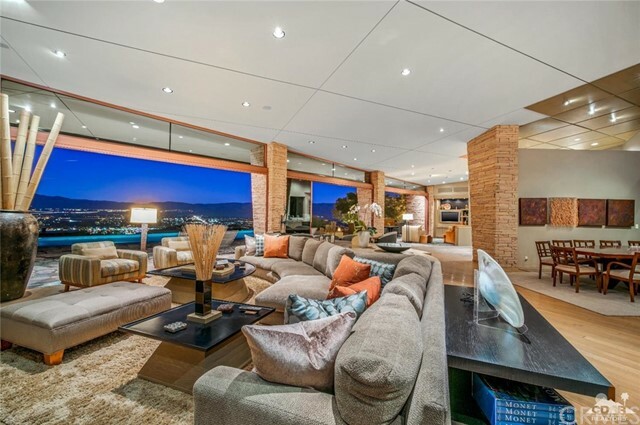 Upon entering the home, you look through the great room, past the motorized walls of glass that open to the twinkling city light views of the Coachella Valley desert floor 700ft below. Extensive stone work was used to compliment this hillside estate, the walls of stone, 36x36 limestone floors and hand selected slabs of granite provide focal poi"
"This sleek, modern estate is located in the prestigious guard gated community of Thunderbird Cove in Rancho Mirage. Designed on a grand scale for Joan Kroc by Holden and Johnson architects collaborating with legendary interior designer Steve Chase, this house has been transformed into a modern piece of art. This estate has received recent top level updates such as a new media games room and additional garages. 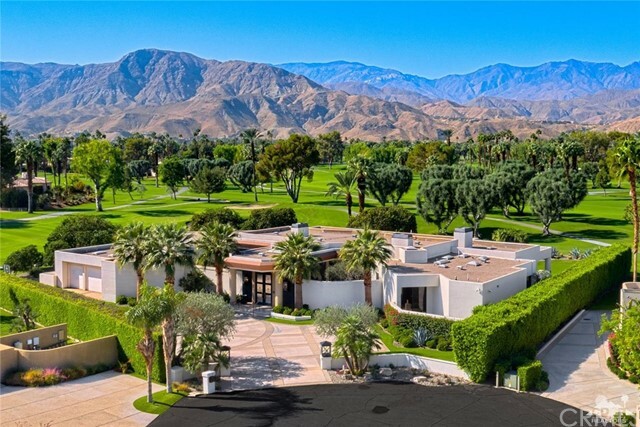 The home is positioned on a 1.22 acre lot taking advantage of mountain and garden view"
"Own a piece of Hollywood s Golden Era with the renown estate once owned by the international celebrity who won an Academy Award for the classic White Christmas . 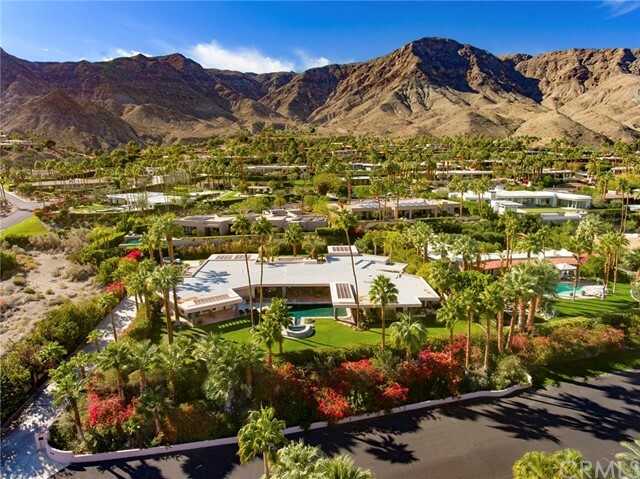 Situated in the exclusive and prestigious community of Thunderbird Heights in Rancho Mirage, California, it was built in 1957. A fusion of art and architecture in a Mid Century design with a Moroccan theme. On nearly 1.14 acres, the modern residence has approximately 6700 sq. feet of living s"
"Home is an absolute sale Home is sold unfurnished. Absolute Sale!!! ALL Offers Considered SELLER SAYS SELL!!! Call for private showing. Three Custom Built homes on Clancy Lane on 2.44 Acres, Tennis Court, Pool, Lakes, Putting Greens, 5000 Bottle Wine Cellar. Homes are exceptionally designed for living and entertaining. Price includes Property next door. All selling for 4,999,999. Call today for more information." "Absolute Sale all offers considered. Three Homes on 2.44 Acres. Tennis Court, Lakes, Putting Greens, 5000 Bottle Wine Cellar. Private Estate with 5 car Garage. Misting System. Remarkable grounds excellent Corporate Retreat Family Compound, Investment Property." 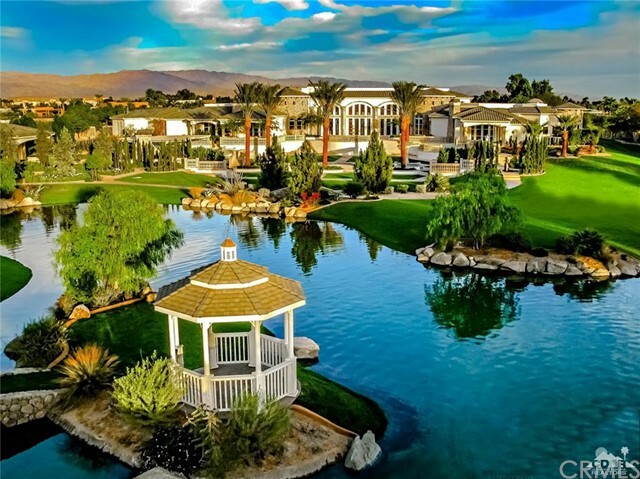 "This sprawling magnificent private estate is located in the upscale enclave known as Cypress Pointe in Rancho Mirage. The elevated 1.13 acre property consists of a 7060 square foot custom home designed by Michael Kiner and built by Stoker Construction with the finest materials, finishes and workmanship. The living and entertainment areas are oriented toward the unobstructed southwest mountain panorama. From the living room, bar and dining room to the family room, breakfast room and kitchen, you "
"An artists vision creates a whimsical estate unlike any other in Rancho Mirage. The compound, named Terra, boasts 2 foot thick walls of rammed earth and steel rebar and wine stained floors composed of earth and concrete. Upon arrival a vast property featuring 1.5 acres of land transport your to a sanctuary unlike any other. This custom estate designed by Jim Mcintosh has an open floor plan, and utilizes significant materials sourced from around the world, the embody an artist touch, such as Peac"
"The name Star Point given to this home by the original developer is the best description one could use when talking about this home. 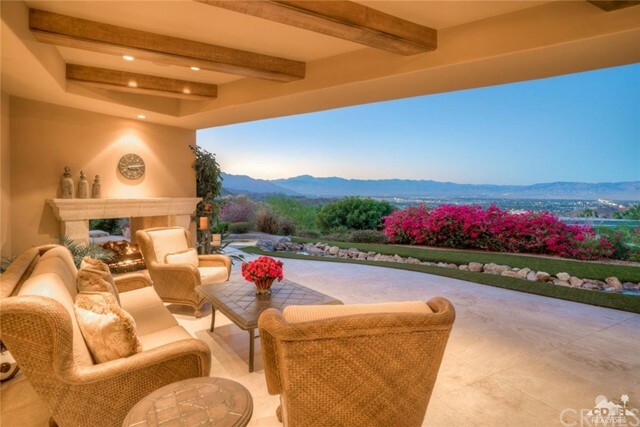 Located at the top of Rancho Mirage in Mirada Estates you can almost reach up and touch the stars while enjoying the panoramic views of the twinkling city lights on the valley floor 800 feet below. This expansive 6,586 SQ FT 4BD/4.5BA home, complete with office and guest house is truly one of a kind with pocketing walls of glass that incorporate the indoor/outdoor "
"Located behind the gates of prestigious Mirada Estates and sited on the same hilltop as the world famous Ritz Carlton Rancho Mirage, this incredible estate home offers dramatic down valley views, mountain views and ultimate privacy. Built in 2006 by respected developer Richard Pruter, PARR Development, offering the highest in quality construction, design & features. This home is accessed through a private courtyard with pool, spa & mountain views and offers the best in indoor/outdoor living. Onc"
"Magnificent estate compound with over three acres of park like grounds on prestigious Clancy Lane! Six bedrooms, seven and a half baths including guest wing and guest house. Approx. 10,495 sq. ft. Features elegant stone entry bridge over water, living room with marble two sided fireplace to dining room and custom marble sit down wet bar. Gourmet kitchen with center prep/cook island and family room with fireplace, media and breakfast nook. The guest wing has a living room with fireplace, full kit"
"Custom Contemporary is a car lovers dream! One of the best views in the valley at Mirada Estates! Five bedrooms, seven baths including casita with living room, fireplace and wet bar. Approx. 5,800 sq. ft. on .92 acre lot. This home is a real showpiece featuring stone waterway to entry, stone finishes and stunning foyer. Great room with walled fireplace with media, formal dining, custom bar and custom glass wine room. Gourmet kitchen with center-island and stainless appliances. 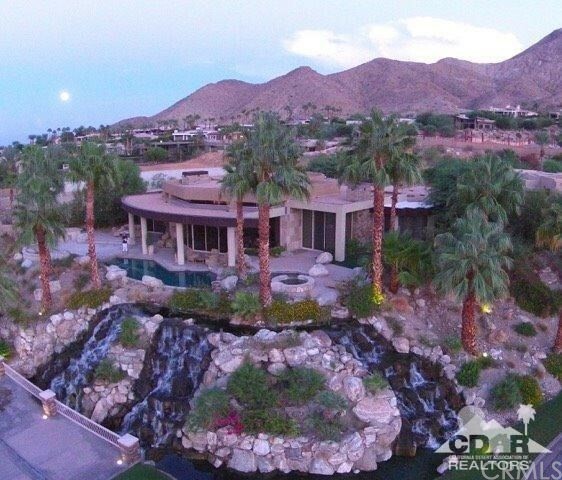 Beautiful master s"
"One of the Desert's finest estates located in the heart of Rancho Mirage off Vista Dunes! 5 BR, 6.5 BA incl. 1 bedroom guest house. Approx. 7,179 sq. ft. on 1.43 acres of impeccable grounds. Circular drive to beautiful courtyard entry with custom fountain and palm tree surround. Towering stone entry foyer to great room with custom fireplace, formal dining, custom bar and wine cellar. Walls of glass pocket to create amazing indoor/outdoor entertaining. Gourmet kitchen with large table island, sto"
"Located on a corner lot in the prestigious Mirada Estates development sits another stunning home with incredible views brought to you by Equestrian Life. Walls of glass open to breathtaking, panoramic mountain and valley views and, as dusk settles in, the city lights from Palm Springs start to twinkle. This 5 bedroom, 4.5 bath, 5,677 SQ FT home features a detached two bedroom casita, four car garage and hand-picked custom finishes throughout, such as Walker Zanger stone slabs, Dornbracht faucets"
"Contemporary luxury describes this stunning owned SOLAR home located in prestigious Thunderbird Heights. 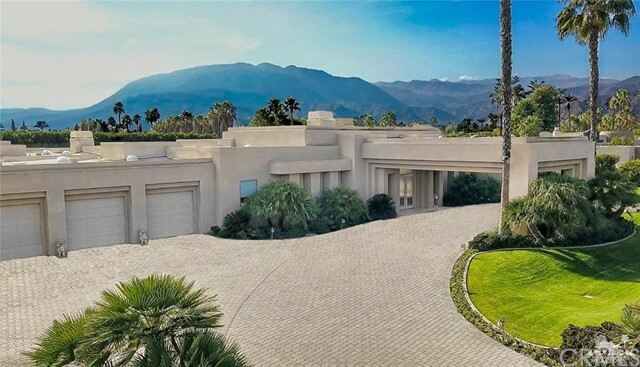 A former celebrity home this beautiful estate is located on over 1 acre of private lushly landscaped land with magnificent views of the valley below. Beautiful double-door entry greats you to a grand living room and formal dining area ready to entertain your family and guests. The gourmet kitchen is glamorous as well with beautiful granite countertops, stainless steel appliances, wine fridge "
"Tumbling Waters is an incredible contemporary residence, perfectly positioned above the Highlands waterfall in Mirada Estates on a magnificent .69 acre parcel, boasting breathtaking panoramic mountain & valley floor vistas + city lights at night! The balance of energy between the desert & the sophisticated architecture has an incredible Zen-like influence. The interior spaces were designed & custom furnished to fully involve the surrounding desert environment & views. Floor to ceiling glass, Fre"
"This BEAUTIFUL custom home in the prestigious guard-gated development of The Renaissance off Clancy Lane is truly a design original ~ A grand California contemporary with touches of India set on 1.39 Acres with STUNNING South-West mountain views.The spacious great room, loggia and grounds make this property perfect for entertaining.The 2 bedroom, 2 bath detached guest house with garage is ideal for guests. Features include Crema Marfil marble counters in bathrooms, granite counters throughout, c"
"Sited in the finest location in Tamarisk CC - gated section with zero HOA's. 4bd/3ba 2 powder rooms. 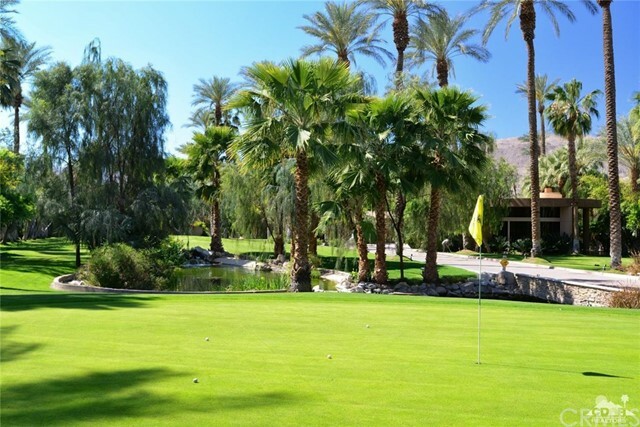 The views astound you for 180 degrees of golf course & expansive southern mountain vistas. The home has been totally re imagined in the finest and most exquisite taste with modern furniture chosen and placed to perfection by decorator Sam Cardella. Not one inch lacks sophistication and perfection. 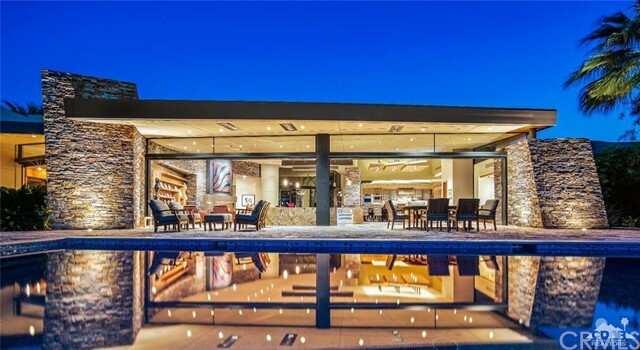 To drink in the views the covered patio runs the entire southern exposure of the home and is able to"
"An incredible opportunity to be able to own one of the most stunning contemporary estates in the Coachella Valley. Enjoy the panoramic mountain views of the Santa Rosa and San Jacinto mountain range from nearly every room. The home features exceptional modern architecture, vertical grain Douglas Fir butterfly ceilings, fleetwood pocketing doors and windows, dual offices, a walk in wine room, game room, gym, Vantage lighting, 2 3-car garages, infinity pool and spa, and a 23.2 kW paid solar system"
"Majestically sited and overlooking the breathtaking fairways of Tamarisk Country Club, this gracious and casually elegant contemporary Villa will dazzle your senses. Perfect Palladian U-shaped floor plan, fountained courtyard entry, high ceilings, monumental windows, walls of French doors, architectural lighting, multiple fireplaces, hardwood and travertine floors and exquisite textures of marble and stone blend to create a stunning environment. Expansive living/dining room with beam ceiling, ce"
"Guard gated Thunderbird Heights living at its finest! Wonderful luxury estate located behind the gates. This one-story, approximately 9,000 square foot contemporary home offers beautiful views of the valley from nearly every room. Perfect open floor plan with five bedrooms and nine bathrooms has a great open dining, living room, and Sinatra bar. Wonderful master suite with two offices, gym, immense walk-in closet and four additional en-suite bedrooms. Stunning and beautifully landscaped backyard"